The strip_chart command, described in the Multiple plots with a common axis entry, creates a single column or row of plots with a common axis. The split command is used to create an n by m grid of plots. creates one column of three plots with no gaps between the plots. creates two columns of three rows, again with no gaps between the plots. creates a two by two arrangement but this time adds a vertical gap between the two rows (but no gap between the two columns). is similar but has a gap between the columns rather than rows. creates the grid of plots with both horizontal and vertical spaces. The split command can be used to make a n by m arrangement whereas strip_chart creates either a single row or column of plots. 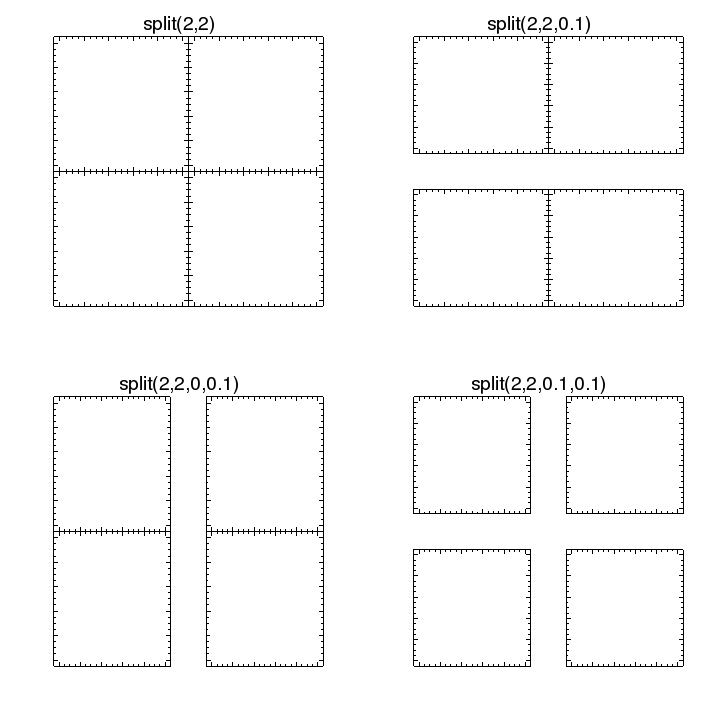 The plots created by split do not have any axes, whereas those from strip_chart. Also, the common axis of the plots in the latter case are "bound" together so will always display the same data range and use the same scaling. split will only create plots if necesary, re-using any existing plots, which means you can use it to add plots to a visualization, or to rearrange the existing plots. The strip_chart command always creates a new frame and uses this to create the new plots.